You know, it’s tough to blog with a baby in your arms. I tried to get a good photo of Mary. All babies look better with their eyes open – it adds personality. But the flash made her blink. And turning the flash off required both her and me to be very still or else the photo would blur. …and one blurry, eyes open photo. Trust me, she’s beautiful. She’s also my first daughter to have blue eyes at birth. Contrary to popular myth (“All babies are born with blue eyes”), my other daughters were born with murky, dark eyes. Jenny was two years old before we declared her eyes green. I don’t know if Mary will keep her blue eyes, but that they at least started out blue is nice. Brown and green eyes are nice too. Especially when surrounded by a lovely, smiling face. But I confess partiality to blue eyes like these (like mine). ← Perhaps I’ve been reading too much Jane Austin? She is a beautiful baby, Michelle! He who wears the most black wins. What a beaut!Yes, indeed, I have noticed the same thing. Everyone always says that you can’t really tell the color of their eyes at birth but I, who have two blues and two browns, have been able to tell right away whether they were going to be blue or not. The “blue babies” have very deep, but very true blue color. The others just look like dirty water. Adorable dirty water. 🙂 We couldn’t really tell that Shepherd’s were going to be light hazel and not brown until a few months ago and the kids almost 2 already! She is beautiful! Does she look like the other kids did? I always loved that I could tell that they were mine from the beginning (except the first) because they looked familiar. What a SWEETIE!!! !I love the pics of all the kids….children have the most beautiful eyes, no matter what color they are.Give her an extra hug and smooch from me, OK? My goodness…I mean I knew you had cute kiddos…but these pictures just seal the deal! What an adorable bunch! I agree, beautiful eyes all! Mary’s beautiful! Two of our three children were born with blue eyes….now they both have green. Our third birth child had hazel eyes and they are just like mine-deep, dark brown. 🙂 All beautiful….just as all of your children are beautiful! Congratulations! What a sweet baby. Actually all your children are very sweet looking. Oh Michelle! What a beautiful family! Mary is just lovely, and fits right in with all those cuties.Many congratulations! I’ve mostly seen pictures of you and it seems like your baby looks like you! I love the shots of all of your kids! Mari was MY only baby who had blue eyes and I thought she was going to keep them…they are turning kind of a grey/green now, though. Hmmm. I always thought I’d have a blond, blue eyed, curly haired boy. Boy oh boy, did I ever NOT have anything like that! It’s so funny the combinations we get. I joke sometimes that that’s why I have “so many” kids…to see what kind I have next! 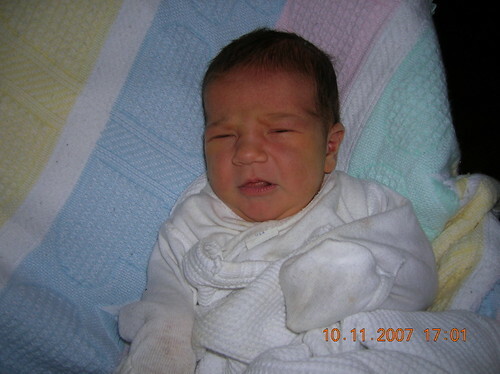 I remember when our sixth was born ~ he evened the score to 3 and 3 in our home. That was such a sweet, fleeting time with the children all still young and cute. We are now one more child and 5 years later, and I have one child, while quite handsome and tall, isn’t cute and sweet any more, and 2 teenagers and only two left with all their baby teeth. It just flies. And yes, please sniff her head for me. I do think that is one of the most heavenly scents there is. Blessings! What a perfect little angel!! Oh Michelle, Mary is just beautiful! I’m so behind on blog reading, but Congratulations!! Love the pictures.